There is no better way to explore the capital city of Texas than an Austin E-Scooter tour with Nation Tours. Nation Tour’s famous Capital City E-Scooter Tour begins on the West side of Austin’s downtown. You will ride past Austin’s gleaming skyscrapers, lovely parks, and past its many historic landmarks. 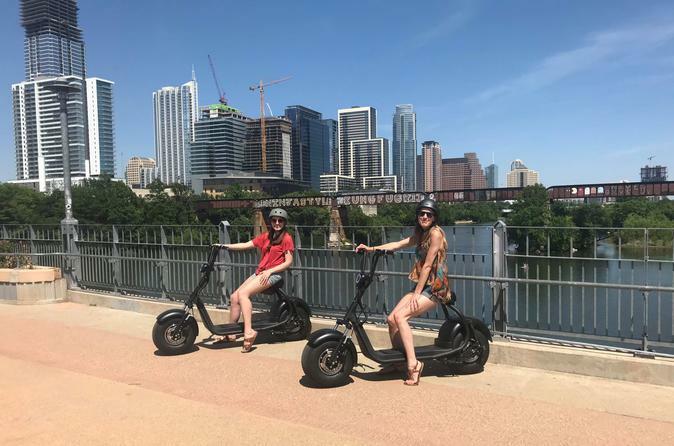 After cruising through downtown, your E-Scooter adventure arrives at Lady Bird Lake where you will take in majestic views of Austin’s skyline. Your tour guide will point out Austin’s famous bat bridge, along with many of Austin’s other famous sites. Next, your tour guide will lead you and your group effortlessly through one of America’s most modern downtowns. Other sites may include world famous 6th Street, the Austin Convention Center, Warehouse District, 2nd Street District, and other landmarks. Book now, as this tour will sell out fast!